Hey there all, I had a great response as to the Blog I did about Girls on bikes and have continued this as I want to promote this as much as I can. Photos below have been either sent to me by people or I have just googled, but please- if you knw the photographer and the models names, let me know so I can credit them for their work, unfortunatly google doesnt always put the credits to the photos but I wanted to show these great shots and hope some of you will recognise these so we can credit everyone who took them or is in them. Below is a mate of mine with her Riding mates that I always not only had the utmost respect for, she is great riding a motorcycle and has a variety of them to boot. In the middle is Sarah Bradley,To her left is Kate Strong and then Karen Stevenson, to her Right is Tracy Holroyd Smith. 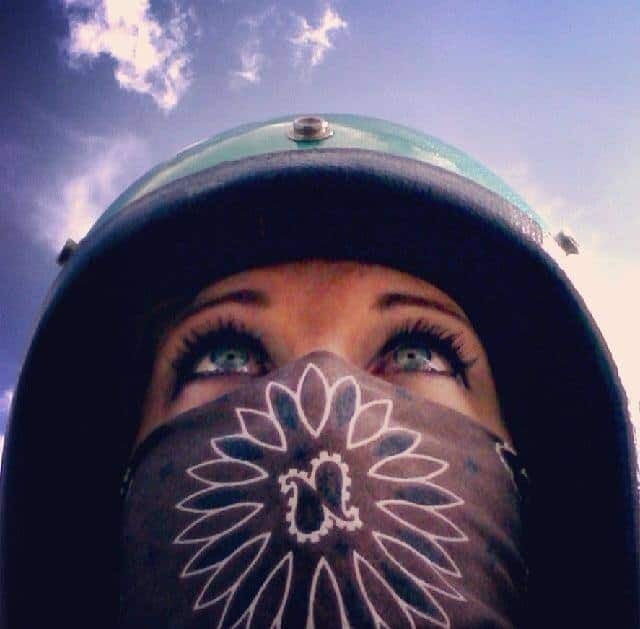 Girls look great on Two wheels and we so need more of them where we are and am hoping just some of these photos may inspire your other half to get out there and enjoy the fun we have on Motorcycles. A real couple of Salt & Shakers here, 2 great friends who ride back home. Sarah Bradley and Karen Odare-Sharman. Another mate of mine is Wendy Lemley-Griffiths has a Norton and a bunch of bikes and is an ex pat like me. Another mate back home is Karen Ward and she has been riding for Donkeys. Next up is a mate of mine Siti J. Ahmad-Moore and she is Tiny but still rides a Ducati, a great girl who loved Motorcycles. Alicia Mariah E;fving aka: MotoLady who is a photographer/Graphic designer and works at Founder (Company) at MotoLady. Let me know what Photos to credit you with Alicia as I have no clue on these as nothing was on the images and need photographers to get their recognition and Models too. Cool shot, pushing the bike out in the Morning. Little Royal Enfield all dressed out. Countryside ride. Louise from l’équipée, on one of Zadig ou la Destinée’s custom bikes. 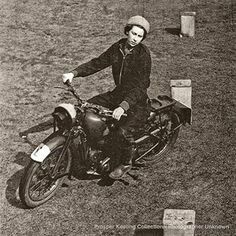 Firing up her Triumph T120 by the Kicker. Red head is ready to go. Over the golden gate, cant be late, Gotta date! GT Continenal takes some starting sometimes. Getting some well earned shade after riding. SR400 getting into a bend. Life really is better on a Motorcycle. Thats a great shot right there. Thats what mates are for right? yeah, all the boys are behind! Is this a Trio of Trouble? Thats a great shot and a big Scarf! In the canyons and no Lid- tut tut! Oh a Manx Norton too! Love this trials section, come on Mum. Trying to get home before mum see’s me with no pants on. Now thats getting right out in the sticks! Getting into it on a Honda CX500,. Having fun in the countryside. A great shot in the corner. I have no idea but it aint no washing machine. At the Ace cafe back home. Riding the RE for fun. So much nerve to try this, awesome shot and awesome Girl, well done. Come on lads you have to try and keep up with me. No headlight needed as my hair is Bright enough. What a eat shot taken here. OK on Green we Go!!!!!! Getting ready to get on her steed. Yes we wrench too dumbass! Yeah- I can beat that Train. Always dug Vintage Dirt Bikes. Great shot in the Tunnel. Nina Savage the legend of the 59 Club! This entry was posted in Blog and tagged 2 wheels, America, birds on bikes, bonneville, brit iron, BSA, busy bee cafe, Girls on bikes 59 club ace cafe, Girls ride, Rockers rollers, thruxton, triumph, trophy.